"We moved from San Francisco to Detroit about six months ago; we had been living in a 500-square-foot one-bedroom, and we moved into a 1500-square-foot 1960 townhouse designed by Mies van der Rohe where our mortgage is half what rent had been in San Francisco. The importance of Michigan often gets overlooked as midcentury modern becomes more and more trendy. Herman Miller, Steelcase, Haworth are still make modern furnishings here in Michigan. 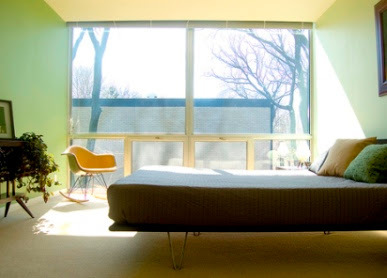 Grand Rapids and Holland were once filled with now-defunct furniture companies that made iconic designs by Paul McCobb and others. There is still an abundance of amazing furniture (at very reasonable prices) in the thrift stores and antique malls. Detroit is where modernism was born. You can see the spot where Henry Ford built his first automobile. It's now an old movie palace that has been turned into a parking lot. Just a few miles from downtown Detroit lies Cranbrook Academy of Art, where a man named Charles Eames used to get dressed up in a tuxedo to attend faculty cocktail parts with Elial Saarinen (who designed the entire school), smoking with Elial's son Eero and Harry Bertoia, Gyo Obata, and flirting with Florence Knoll, eventually catching the eyes of a young teacher named Ray Kaiser. For sixty years the products those two designed together have been assembled by Dutch craftsmen across the state. Eero designed many of his iconic buildings from Detroit, including GM's breathtaking Technical Center in Warren. The world's largest concentration of buildings designed by Ludwig Mies van der Rohe lies just steps from the heart of downtown Detroit, set in a beautifully-landscaped park that has become one of the most successful urban redevelopment projects in the country, despite its location in a city that has itself outlived its usefulness in the eyes of much of the world. Moving here, I really wanted to buy as many vintage furnishings that I could that were made (or designed) here in Michigan. 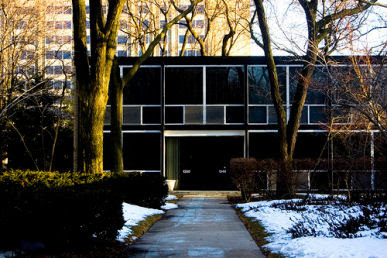 The most important and interesting features of the Mies townhouses are the full walls of glass in every room. We are not designers or artists. I am just a stay at home dad." Yes Michigan!!!!! My heart always swells with pride when I see photos of Detroit, my tough, gritty, hard working, creative home town. I had no idea that Eero Saarinen built the Tech Center. My Dad used to work there! Maybe I'll swing by there this weekend when I'm visiting, for old times sake. Beautiful house! I love all the light you get. I'm in love with your bedroom! That bedroom is so calm and relaxing, I love it. Hooray for simplicity! What is that hat the little girl is wearing and where can I get one?? Aside from being majorly jealous of this home (What I'd give to live in a Mies apartment) I love the way they've pared down their furniture and objects so that just the beauty of each piece shines through. No clutter- it's wonderful. 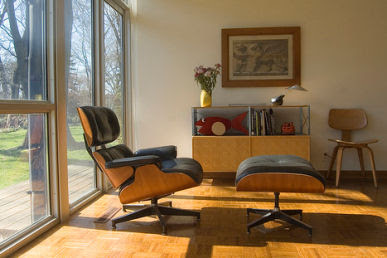 That Eames-y living area filled with sunshine is perfection. 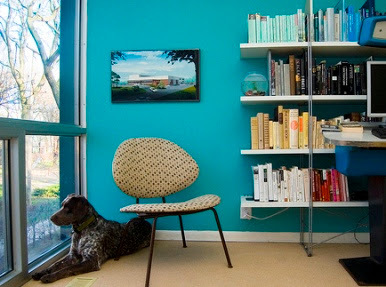 please please please - do tell the name of the turquoise paint! The furry friend is Wendell, and clearly he just HAD to be in near every shot. the turquoise in the office is sherwin williams "reflecting pool," but it is a little less vibrant in real life. the hat on the little girl was deadstock from the 1950s-- a friend of ours picked it up some place in Brooklyn where this guy puts all these things he found sitting in a warehouse out on a rack on the sidewalk. I know that is so not helpful. thanks, everyone, for saying such nice things. i've been reading sweet juniper for a while now and i must say, i was hooked from the get go. now seeing the fantabulous home they hole up in, i am jealous, along with hooked. i have to ask.....is that a bowling table/score keeper (sorry, i so don't know the correct term for it) in front of the bookcase w/the computer on it? yeah michigan! i grew up on the lakeshore and am still inspired by my youth there. thanks for bringing the midwest back into the design scene, not enough is said about the creative people living it up in the middle! aw yay! i love sweet-juniper.com and am excited to see them on this blog as well. what great photos. Nice photos, sweet-juniper is an interesting blog and this one seem to be also. Love Dutch, Wood and Juniper but am aghast at the "just" a stay at home dad comment. Never apologize for being able to fulfill this role for your family. They're lucky to have you. Super....Sweet Juniper and Design*Sponge, my two favorite blogs together! What could be better? Dutch, Wood, and Juniper's home is really lovely. I would also love to see a full tour of Grace's home....the sneak peaks look great. So cool to see where Juniper & co. live - they make me want to move to Detroit because they make it look gorgeous. I love the pics of the apartment towers above the couch. Those are some of my favorites from juniper's Flickr photos. Thanks for such a great look inside. I was an architecture history major in college and will go back to studying when baby grows up. Am so jealous of the new juniper digs. Oh, what amazing photos! So fresh and clean. Love that. Thanks for the peek! You've made a lovely space. We have some of those ninjas, in 3-D form. i also lived in a mies van der rohe high rise-the pavilion apartments which is adjacent to the nicolet/joilet townhouses in lafayette park....i had an apartment fire and was forced to move out of the building i loved so well-after a 12 year stint of east coast living i moved back to the pavilion because of the incredible architecture and floor to ceiling windows which were allowed me the luxury of light for painting....i am now living in ann arbor, another little cultural mecca in mi...thanks for the photos of an incredible dwelling in a treasured community! Thank you for sharing this. We've just left Michigan (Lansing) for Chicago because of the economic troubles there, but your post left me feeling homesick. What a beautiful home much better than a box apartment in San Fran. I love reading that blog and their home is just what I thought it could be and more...great taste and fun for little Juniper! My heart just jumped a little bit when I saw this beautiful home. I grew up right near these condos and have always coveted them. So lovely. So simple, so gorgeous. The bedroom is my favorite. My heart swelled with pride reading about a celebration of our downtrodden state (Michigan) and its treasures in architecture and design. Your home is just beautiful - we, too, have been searching for something with a little soul, which is lacking in Metro Detroit these days, sadly. Thank you so much for letting us in to your beautiful home! Very nice home. I love the bright colors of Juniper's room. I also very much love her Wedgehead. We are an UglyDoll family. Love how the books on the shelf are organized by the colors of their spines. I am a regular reader of Sweet Juniper, and I had to see the pictures of your home. I am so impressed!! I had no idea such a beautiful home could be found in a city that is sometimes not-so-beautiful. As are most of the others who posted, I am a native of Michigan (Charlevoix, to be exact) and your posts about your adventures make me homesick. I was so excited to read this blog entry. I attended Cranbrook growing up and lived only 5 miles away and only now, by moving away, have I realized its true beauty and importance. I love the history that Cranbrook offers Detroit. Hi Dutch. Your home is simply stunning and the details are fantastic. I would love to talk with you about a possble feature for Detroit Home. It's rare to find homeowners who're so passionate and knowledgeable about Detroit and Michigan-based deisgn. Let me know if you'd ever be interested in this sort of thing. Best. I love your house- thanks for letting us in. And "I am just a stay at home dad." ? Not JUST. It is a very important position. . I love your Juniper blog - it's great to see there are other Dad's out there like me! Question - Where did you get the big pillows on Juniper's bed...my wife is IN LOVE with them. off topic, modernism was not born in Detroit. I love this post! I had no clue what I was leaving behind when I moved to Arizona from Michigan straight out of school last year. If I had the chance, I would come back just for the history! I definitely plan on taking a day to explore the thrift stores when I visit. :-) Thank you!!!! 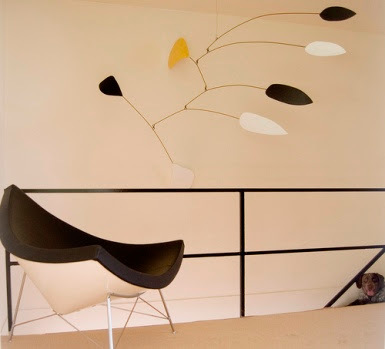 I have seen those mobiles in museum exhibits and in magazine articles but never have been able to find out who makes it or where i can find one. can anyone help?!? Love the bedroom. Could you share the paint colors? It looks like a light green on the walls and a shade of pale yellow on the ceiling?